vision Every person has the opportunity to learn, work, and thrive in all aspects of life. mission To help people reach their fullest potential through education, job placement, and career pathway services made possible by community donations, purchases, and partnerships. For nearly 100 years, Goodwill of the Olympics and Rainier Region has been committed to providing the most impactful education and employment support to individuals in need. We have done this by understanding what organizations require in job candidates and refining our services to prepare people for long-term success. 2018 was a year of renewal for our Goodwill as we took important steps to meet the challenges of an ever-changing retail and economic landscape. Training and educational support expanded and deepened, giving people access to a broader range of foundational work skills and career readiness services. Operationally, we implemented cost-effective improvements that reduced our overall expenses and employed new customer-focused strategies in our retail stores, resulting in a substantial increase in revenue -- and more support for our mission programs. And, importantly, we looked to the future and asked ourselves, “What is our greater vision for the communities we serve and how does our mission contribute to that vision?” For the answers, we turned to our dedicated team of employees – the people who work every day with our participants, customers, stakeholders, and community partners. Through that work came this promise: to help people realize their fullest potential through education, job placement, and career pathway services made possible by community donations, purchases and partnerships. This mission is embodied in the personal stories featured in this year’s report, individuals who dedicated themselves to improving their lives and are now achieving goals that once seemed out of reach. The vision we imagine – that every person has the opportunity to learn, work, and thrive in all aspects of life – describes a future that will be realized through a collective effort of our team members, donors, shoppers, funders and partners. Together, we can make this vision a reality for all to embrace and enjoy. Thank you. New skills and education bring a brighter future. BRINGING OUR MISSION TO LIFE Helping people reach their fullest potential… Nearly a century ago, our Goodwill opened its doors with the commitment to assist the most challenged segment of the unemployed population, providing a hand up, not a hand out. Though this core mission continues to this day, our services have evolved and expanded, providing thousands of individuals throughout our 15-county region the education and life skills they need to achieve long-term success. In 2018, our workforce development programs and services continued to grow with heightened emphasis on understanding what employers are seeking in job candidates. This effort led to the development of enhanced education, job placement, and career pathway services designed to give unemployed individuals the skills they need to become more competitive and attractive to employers. now form the core of the program. The program, which will provide graduates with a Goodwill “ready to work” credential, will reach an anticipated 400 students at our training facilities in Tacoma, Longview, and Yakima. Milgard graduates of the Vocational English-as-aSecond Language program, Sopheap Chhem and Kim Tran Nqvyen, with instructor Rocky Sandoval. adults received six months of on-the-job training combined with Goodwill case management and work readiness skills. Upon completion of the pilot in July, all eight were placed in living-wage local employment. Based on the success of this pilot project, the model has been implemented as a recurring program at NorPac and is being introduced to other large employers in Cowlitz County. We are also tailoring programs with employers wishing to address the challenges of employee growth within their companies. Milgard Windows & Doors is partnering with Goodwill and Clover Park Technical College to help eliminate barriers to career advancement and bring opportunities to its non-English speaking employees in Tacoma. As part of the parent company’s Masco Million Differences Campaign, Milgard is hosting and funding a pilot program featuring onsite Vocational English-as-a-Second Language (VESL) instruction, along with financial literacy, workplace competencies, and employee retention counseling. With successful outcomes, Milgard may adopt the program in other locations and Goodwill may make the model available to other companies facing similar challenges. Christina Patching is participating in the industrial manufacturing pre-apprentice program offered by NorPac in partnership with Goodwill. Public Utilities (TPU) and the City of Tacoma’s Environmental Services can now receive up to $160 in credit on their utility bills by enrolling in our financial education program. Goodwill and KeyBank’s “Key to Change” financial education course and a series of oneon-one personalized financial coaching sessions will be available to an estimated 900 utility users over the next two years. The program helps customers understand bills, payment options, assistance programs, conservation tips for power and water, how to improve credit scores, budgeting, and financial planning. We are grateful for the community partnerships that make many of these services possible and also for the Thanks to the services she received through Goodwill’s partnership with United Way of Pierce County’s Center for Strong Families, single mother Donna Duverne is now enrolled at Tacoma Community College and taking steps toward earning a degree in nursing. Made possible by community donations, purchases, and partnerships…. Banner Bank was host to Goodwill’s Rising Chef Dinner f Forte Harnick with Banner Bank’s Dan Bogart, SVP-Com Banking Officer; Doug Hedger, VP-Commercial Banking Outreach Officer. Goodwill costume experts helped more people than ever create unique outfits for Halloween. customers to visit our stores. Six years of redefining Goodwillâ&#x20AC;&#x2122;s role in Halloween continues to produce strong results as sales of Halloween products grew by 18% in 2018. In addition, our online sales business developed new processes and efficiency gains in 2018, laying the groundwork for continued growth in 2019 and beyond. The journey forward Our ongoing work is part of a collective effort that includes shoppers, donors of goods, financial supporters, and partner organizations, moving the community as a whole closer to the vision of every person having the opportunity to learn, work, and thrive in all aspects of life. Determined to succeed and thrive. from a part-time position to full-time employment. The increased hours have provided Tawny with much needed additional income, helping her to pay down her bills and improve her overall financial situation. Today, Tawny continues to excel in her job and remains thankful for the tools she learned at Goodwill and the ongoing support she receives. 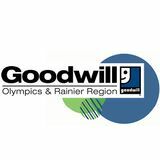 Goodwill of the Olympics & Rainier Region covers a 15-county service area in Western and South Central Washington. 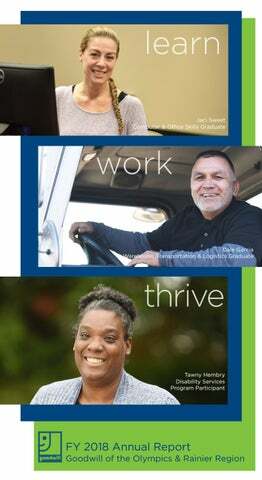 From our Work Opportunity Centers in Tacoma and Longview, our dedicated team of professionals delivers in-depth training, education, career coaching, life skills and job placement services that prepare people for success. Employment Pursuit & Networking Resources School to Work Ticket to Work Disability Placement Services Interview Preparation Programs Job Placement Services Job Search Center Networking Programs Resume Development Workshops Job Fairs Senior Community Service Employment Program (55+) Military & Veteran Services Goodwill is licensed by the State of Washington as a private vocational school. A passion for driving intersects with a desire to serve others. distributor but also a contributor,” Dale reflected. Seeing his accomplishment come full circle has had a lasting effect on Dale. Corporate Alliance Program Goodwill is so grateful for the support of these generous corporate partners. Through financial donations for job training and educational programs, to hiring Goodwill program graduates, their commitment impacts the lives of thousands of people in our community. New partners in 2018 include: Albertsonâ&#x20AC;&#x2122;s/Safeway, Banner Bank, Pepsi, Print NW, and Sound Transit. The accounting firm Clark Nuber has audited the financial statements in accordance with auditing standards generally accepted in the U.S. The audit received an unqualified opinion. 2018 Goodwill of the Olympics & Rainier Region Board of Directors Chair Christopher Algeo Past Chair C.W. Herchold Treasurer Shahrokh Saudagaran Secretary Judy Swain At Large Bill Dickens Suzy Esposito Barbara Mitchell Briner Colette Taylor Directors Anthony Chen, MD Rory Connally Charelle Foege Demetrius Forte Josh Garcia Daniel Glover Shannon Govia Drew Henrickson Terry Jones Mark Rodriguez Carlyn Roy In 2019, the Goodwill Board welcomes new members Karen Koch and Jacqueline Justice. Work Opportunity Centers In 2018 Goodwill of the Olympics & Rainier Region had two Work Opportunity Centers providing education, job placement, and career pathway services to the public. Goodwill’s Milgard Work Opportunity Center 714 S. 27th St Tacoma, WA 98409 253.573.6500 Goodwill’s Work Opportunity Center of Cowlitz County 1030 15th Ave Longview, WA 98632 360.501.8340 A new Goodwill Work Opportunity Center is due to open in Yakima in 2019. Goodwill’s job placement and job training programs have received the highest level of accreditation available. In 2016, CARF International, an independent reviewing agency, awarded Goodwill a three-year accreditation through November 2019. Goodwill is a WorkSource affiliate in Pierce County, assisting in delivery of employment services.